Students support Uhuru and the African People’s Education and Defense Fund by donating. GRACE DICKINSON TTN Uhuru projects move in a different direction. They pick up furniture donations and are looking for volunteers. Sit back, and spend money on something you can feel good about, without draining your account. Uhuru Furniture is spending money on a good thing. All profits from the store go to a project called the African People’s Education and Defense Fund, which allocates money to return resources back to the black community. “You get excellent quality, low-cost, 100-percent recycled furniture,” store manager Ruby Gittelsohn said. From late-June to late-September, the store will be hosting its annual student sale, where certain items are marked down. “We’ve got real wood,” Gittelsohn said. “No cookie-cutter furniture like you would find in IKEA.” Uhuru could help in fixing up a whole place with quality vintage furniture. Gittelsohn said students can donate furniture and Uhuru will pick it up for free. Customers help avoid a future worse than the present, where 50 percent of the black community in Philadelphia is unemployed – and as much as 70 to 80 percent in parts of North and Southwest Philly. Gittelsohn said that in some high schools, students are holding bake sales to buy textbooks. Meanwhile, the School District of Philadelphia is underfunded almost $5,000 per student every year. The recent issue of flash mobs are another way to condemn the black community, Gittelsohn said. She cited the riot after the Phillies World Series win in October 2008, saying the incident was comparable to a flash mob. “The city dealt with it in a totally different way,” she said. Uhuru Furniture and APEDF advocate for the right of young black people to gather without being pigeon-holed as criminal or dangerous.“It’s slanderous,” she said. Sarah Sanders can be reached at sarah.sanders@temple.edu. Two furniture aficionados give new life to old furnishings at an antique furniture store in Old City. Fear and desperation represent the economic recession facing college students. EarthFest at Clark Park promoted green initiatives to encourage residents to become self-sufficient. 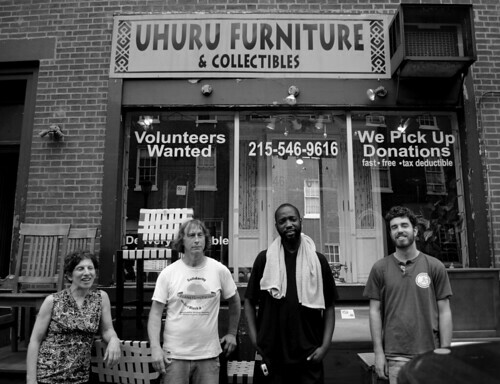 Thank you Sarah and Temple News for getting the word out about Uhuru Furniture! Contact us for exciting summer volunteer opportunities! One correction– I am the marketing coordinator not the manager. Thank you and hope to see you all this summer! I stopped by today and saw some lovely furniture, particularly one piece I hope is still there next week. The staff are so helpful and friendly. One of those places so good you might fare better keeping it a secret, but I believe it’s best to share good news. If I have furniture to donate I’ll call Uhuru! You might not feel good about helping this cult-like group if you looked at where their money goes. Why raise funds for the Stop Snitchin campaign? Who benefits? Only gangs associated with Uhuru who use crack cocaine and drive by terror to institute a modern form of slavery. Their hero worship of cop killers and mass murderers is sick. Kids who fall prey to their message are lost. Can you explain more about these Uhuru-associated gangs, this crack cocaine usage, and these mass murderers? Where did you hear about them? Any reliable sources? And I’d also like to know how they’re establishing a “modern form of slavery?” Are they forcing kids to hand out flyers at First Friday? !